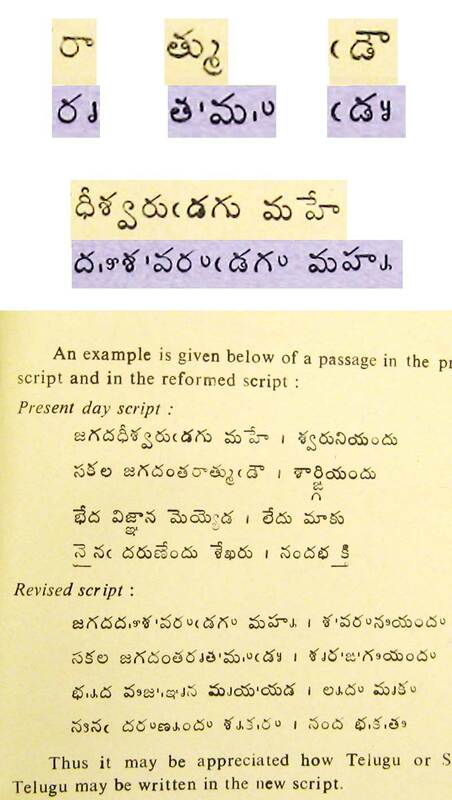 In 1968, Dr. G. V. Satyanarayana Murthi wrote Abridgement and Reform of the Telugu Script, in which he proposed alterations to the Telugu script that would allow for easier typesetting and reproduction. In Telugu, the vowel associated with a consonant is changed by adding additional marks above or below a base consonant character – which requires either extra overlapping pieces, or requires an entirely new character to be created for each combination. Similarly for showing conjunct characters, in which two consonants are fused together. In metal type, it means a huge character set, and the production of expensive and complicated overlapping type. It also means that it’s very time consuming to set. Dr. Satyanarayana Murthi suggests a method of script reform that would eliminate the need for overlapping type, by using dashes and full-sized characters to represent conjunct characters, and the vowel signs, unattached and placed next to a default consonant character. A closer look at some of his suggestions, above, with the purple being the reformed script. Conjunct consonants are now represented by using a small dash to the right of the first consonant, and setting a full consonant next to it, instead of using one of the separate sorts that usually lie below the baseline. The foreign aspirated consonants (or ‘vothu aksharams’), which had been represented by adding a line to the bottom of, or dot in the middle of a base character, be represented with a simple dash to the side of the character. Note that it actually makes the set paragraph much longer than the original text, showing that ease of typesetting would translate to longer line-length. I’ve never seen this system implemented outside of this pamphlet, but it very well could have been attempted. Very interesting ideas, though! I don’t think this type of reform works and should work. It is changing the script to make it easier to typeset. The typsetting system must be improved not the script. @hindirinny Thanks for the post.